The Expatriate Chef is hosting this edition of Weekend Herb Blogging and this week I'm following on from last week and featuring Black Truffles. This is an Umbrian Black Truffle and while the white truffle has my heart, the black truffle probably offers more possibilities in the kitchen. Stored in items such as polenta, flour and rice it will infuse them with its earthy scent. In this case I've been storing these truffles in rice but not any ordinary rice. 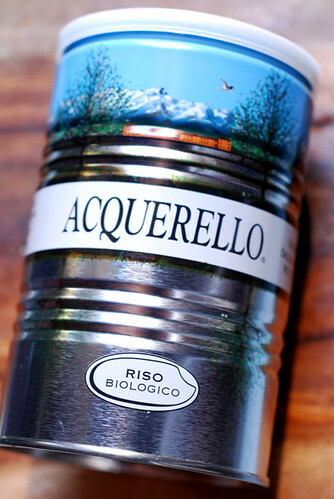 Ever since attending the a taste workshop at Slow Cheese I've been fascinated by Acquerello's aged Carnaroli rice. 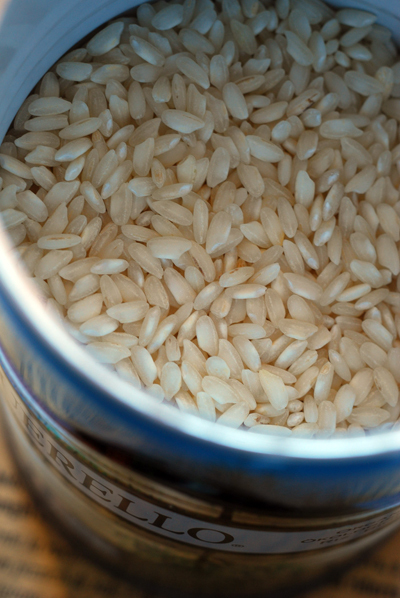 Unlike regular rice, the unhulled grains are stored in temperature controlled conditions from 1 to 3 years. It was found that this ageing process retarded the development of starches. This means that when making risotto, the rice will be able to absorb more liquid resulting in a plumper, more flavoured grain. 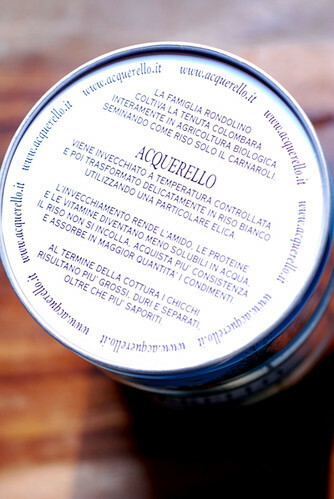 Buried in this tin are the truffles, silently imbuing the grains with their wonderful flavour. 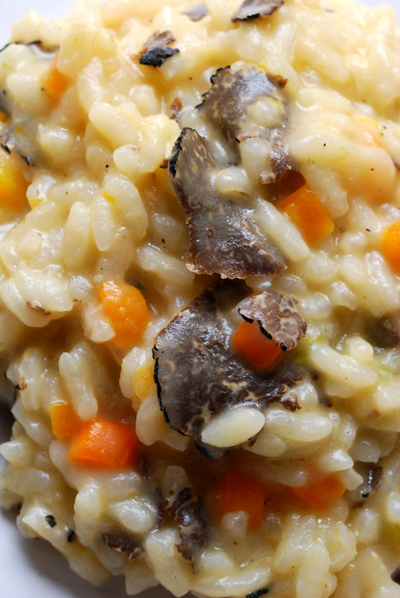 My truffle will be doing double duty as I'll also be finely shaving them and using them in this simple dish of Black Truffle Risotto. 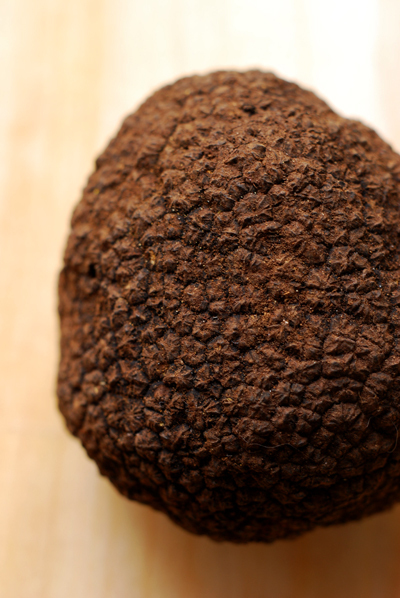 Clean the truffle with a firm brush to remove any traces of dirt that might still be attached. When cleaned, shave the truffle to give you fine slices. Place a little oil and a knob of butter in a deep pan over a medium heat and when the butter has melted add the chopped onion, carrot and celery. Cook this until softened but not coloured and then add the rice. Keep stirring to ensure the grains are coated with the butter/oil and cook for a minute or two. Add a little boiling stock to the pan - this should fizzle and be absorbed almost immediately. Keep stirring and add another ladle along with a third of the shaved truffle. Keep adding ladles of stock as they are absorbed by the rice. Add another third of the shaved truffles halfway through the cooking. When you add the last ladle of stock add the remaining truffle slices. Finally add a generous amount of butter and grated Parmigiano-Reggiano and stir it vigourously into the cooked risotto. 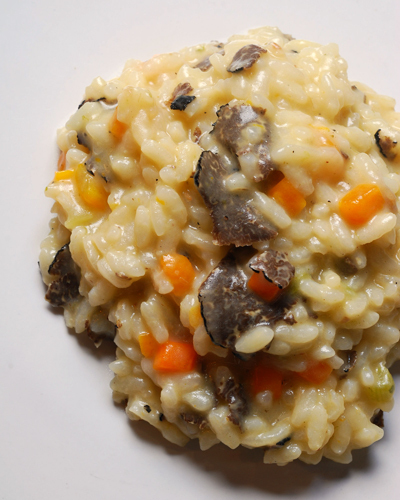 This gives that beautiful creamy and velvety finish to your risotto. Serve into bowl and eat immediately. Sliced black truffles - such a beautiful sight! Absolutely gorgeous and likely delish! So interesting and so delicious sounding. I can imagine this must taste just heavenly. Never heard about this type of rice before either, fascinating. I'm pretty ignorant about truffles... how long did you store them in the rice? Do they "go bad" after a period of time? The risotto looks pretty! 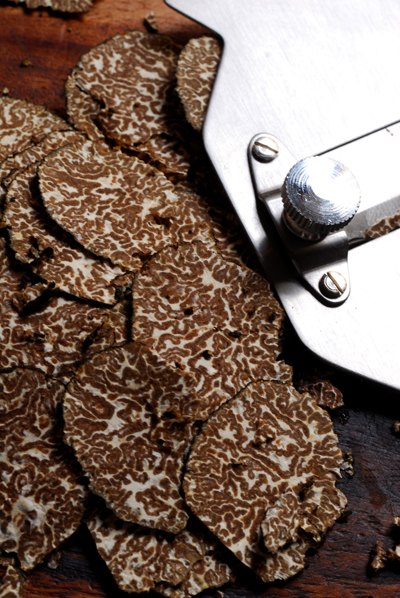 Do the truffle slices remind you of something just as expensive? They look a little like 9+ Waygu beef don't you think? Now there could be be a heavenly match right there! Storing them with the eggs is also a wonderful - truffle omelets! Now I know what I want for Christmas - truffles! Indeed Nora - they are almost too beautiful to eat...almost. Thanks Kalyn - the rice is new to me and I think it is excellent. It does live up to its claims. 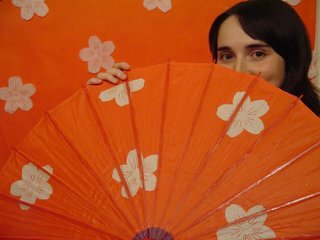 Hi Anon - it tasted like black truffle, sort of like a damp forest. It's hard to say the best thing is to try it yourself! Hi Christianne - yes truffles will go bad, they need to kept refrigerated. These have been keep in the rice for a week now - one was sliced for the risotto and the other is still in the rice, it will be eaten by the end of the week. Hi Neil - Paalo thought they look liked brains though I agree they do look like highly grained wagyu. That would be quite a luxurious match. It's just a pity I can't bring them back with me! Too true Katie, eggs love truffles. I hope Santa hears you and comes down bearing truffles! Thanks Claudia - I do hope you enjoy your truffle experience! such a beautiful photo of the slices!